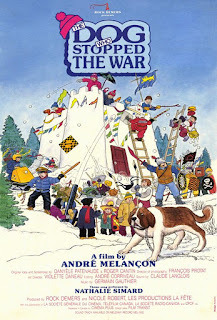 English-language version of the Quebec film "La Guerre des tuques". From the height of the Cold War comes a tale of a real cold war: kids competing over a giant snow fort. 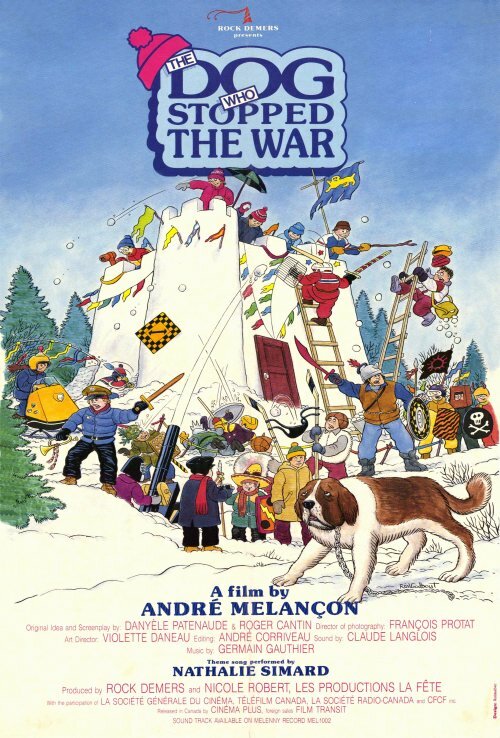 A super-smart dog, toboggans, plenty of snowballs, and a subtle anti-war message make for wintertime fun that the whole family can adore. Also from the same producer we have the Peanut Butter Solution in March! Accompanied by LIVE MUSIC from Mike Dubue and Mike Essoudry! The story follows a group of workers from Hamilton who join the army to fight in WWI, and the travails and temptations that befall them during the war. 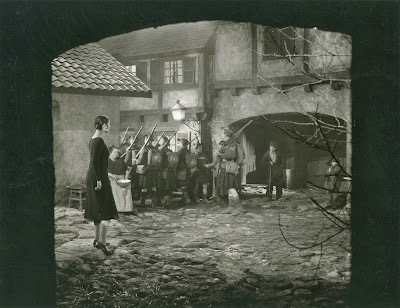 The film has excellent production values and presents a drama that may feel surprisingly modern to today’s audiences. 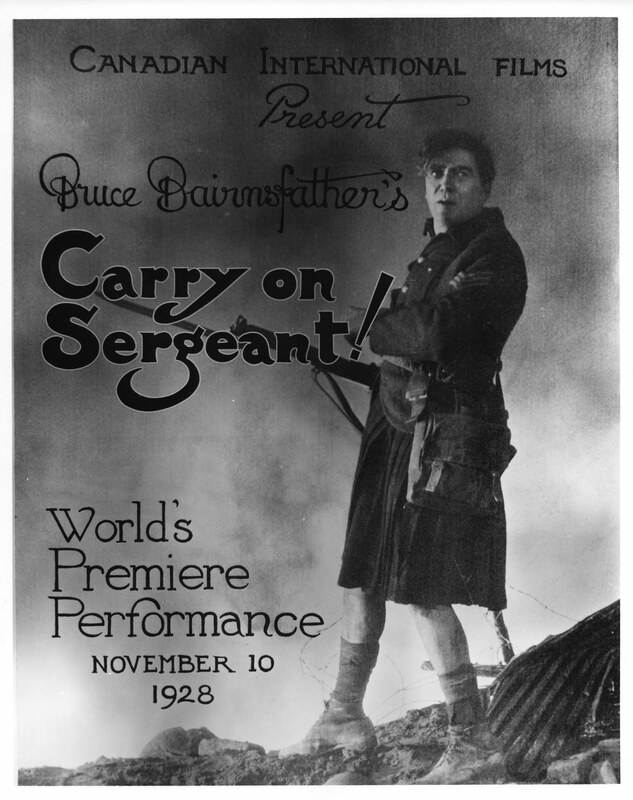 Bairnsfather’s insistence on portraying the soldiers as flawed human beings resulted in some criticism from those who expected a straightforward glorification of Canada’s war effort. Ivory Tower is Canadian director/musician/puppeteer Adam Traynor’s feature film debut. The Ottawa-born Traynor treats this ‘existential sports comedy’ as an exercise in high silliness, with just enough family drama to give the action some emotional heft. 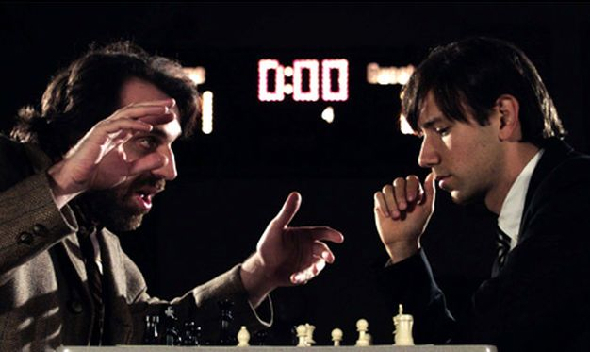 Set in the world of international chess competition, it features the sibling rivalry between two chess prodigies fighting over the game and the same woman. 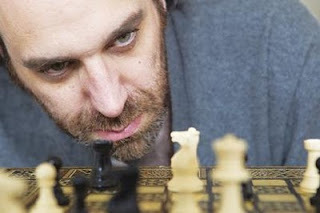 The film is infused with the rhythms of both chess and music, and stars a roster of talented Canadian musicians, including multi-instrumentalist and Grammy-nominated producer Chilly Gonzales, Juno-Award winning DJ/producer Tiga, and internationally-renowned raunch rocker Peaches. Music fans should also watch for appearances by indie-pop superstar Feist and underground pop sensation The World Provider. 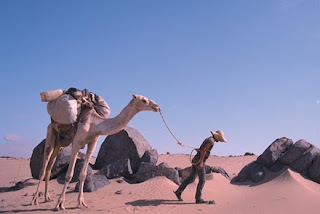 Gonzales, best known for producing Feist’s albums and having his music appear in the Apple iPad commercial that launched the product last year, stretches himself here not only as a musician (by providing the film’s soundtrack) but also as an actor and writer. Traynor and French filmmaker Céline Sciamma – writer and director of the provocative 2007 film Water Lilies – also share scripting credits. Their combined talents result in a comedy thatCahiers du Cinema compared (positively!) 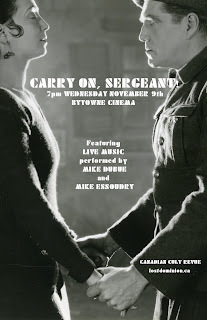 to the work of both Will Ferrell and Wes Anderson, and which Toronto.com described as ‘sweetly nutty’. Perhaps having doubted that a group of non-actors and a first-time director could pull off such a high-concept comedy with any degree of success, the Montreal Gazette ended up declaring it ‘a hilarious and surprisingly accomplished satire.’ With such a talented group of collaborators, perhaps it shouldn’t have been too much of a surprise after all. 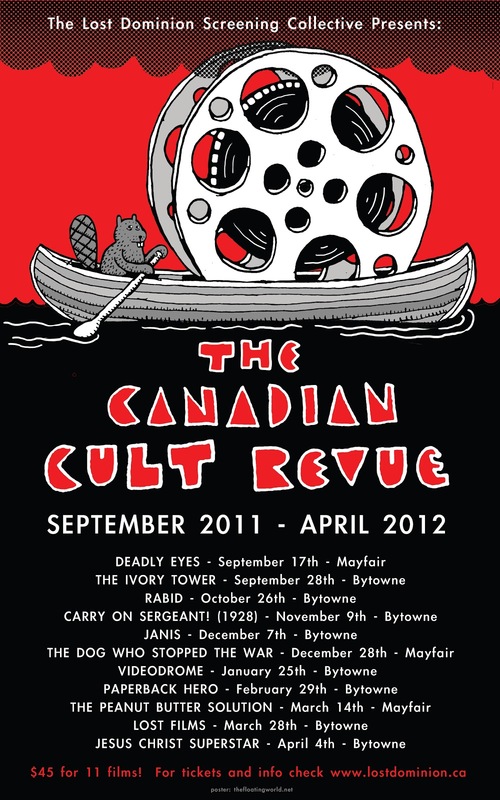 This screening marks the debut of the Canadian Cult Revue film series at the ByTowne, presented by the Lost Dominion Screening Collective. Regular admission prices apply, or you can buy a series pass: 11 movies for $45. The Lost Dominion Screening Collective presents a gorgeous 16mm print of the Canadian camp classic "Deadly Eyes" (1982), in which Toronto is overrun by giant killer rats! Disgruntled maintenance worker Scatman Crothers wants a vacation, scream queen Lisa Langlois wants to bed the gym teacher, and noted rat-ologist Cec Linder just wants to talk your ear off, but these losers are no match for the swarm of genetically mutated rodents - actually dachshunds in fur coats! 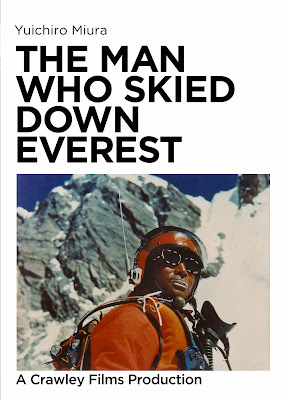 - who set out to eat their extremities for dinner. In spite (because?) of a forehead-slapping screenplay and an overweening preponderance of love interests, this howler is by far the most entertaining Canadian killer-rat movie of the 80s. Import director Robert Clouse, best known for his many Bruce Lee flicks, makes the most of his tax-shelter budget; the film keeps on catching you by surprise with unforgettable set pieces in bowling alleys, movie theatres and subway tunnels. They even eat a baby. 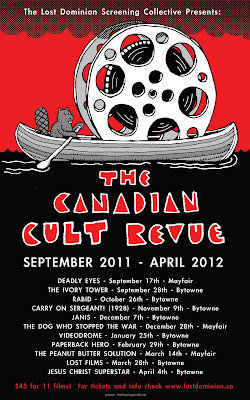 Jonathan Culp - programmer at "Toronto's Classiest Cinema". Trash Palace - will be there in person to introduce this rare gem, one of the most entertaining films ever to be utterly forgotten by its nation of origin. 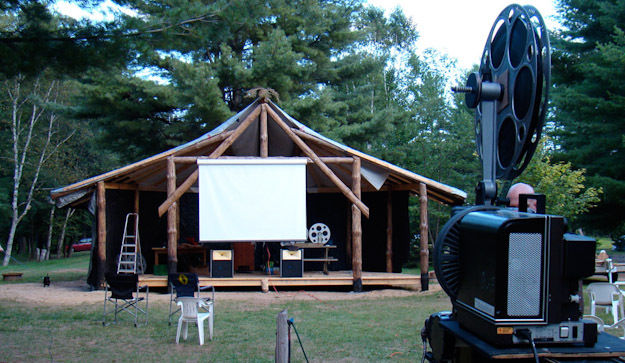 For the 70mm film junkies here is a rare look at the Expo 70' film "Ontario" directed by Christopher Chapman. 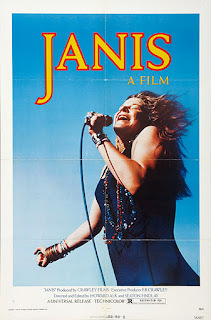 The film was later shortened for the opening of Ontario Place and renamed "Festival" which we played at last years 70mm festival. Ontario, 1970, 26mins, 70mm 5-perf, 6-track mag (though apparently at the Expo 70' screening it ran 12 track, 6 tracks on the the film, an six more running interlock on fullcoat mag. An interview segment with Chris Chapman about the film. GP How did your film for Expo 70, in Osaka, Japan, come about? CC I was in Los Angeles working on The Happy Time when James Ramsay came down and persuaded me to come back to Toronto to do an Ontario film for Expo 70 in Japan. I knew in a sense that I was asking for trouble; but I was keen to communicate to Oriental audiences because I felt there was something in the relationship between nature and man, and work and play, which was universal. I felt I would like to try this again. CC No! Actually, I was thinking lyrically; I wanted to take big pan shots and move them slowly across the screen. And I went out and did this. It was not going to be A Place to Stand and it wasn't going to be music from one end to the other. I wanted to take pieces of a music camp up north, or a June Mardi Gras in Ottawa, or the calliope in Western Ontario - all this things that gave it a spirit somewhat different from A Place to Stand. Bill McCauley was musical director and worked closely with me composing the linking music. I was asked to make a longer film, which was fatal; the crowds were just too big for anything longer. Francis joined me, and we called the film Festival. The first thing James Ramsay from the ministry did at the initial screening in Toronto was to give out a questionnaire asking audiences to compare it to A Place to Stand, which just killed me. The whole idea of even trying to compare the two was the wrong way to go about it. Anyway, it obviously wasn't A Place to Stand, and was never intended to be. So it went to Japan - the longer version - [but] the Ontario Pavilion was an absolute disaster. And I was tied in with its program. There was a monumental multi-slide show that didn't work properly, and it was confused with my film. I went to Japan feeling very depressed after hearing all the bad publicity in Ontario, but in Japan I was greeted warmly and they said the film was an enormous success. The theatre was supposed to hold 650 people, but 1,200 were trying to get in. There were several items in the papers about the success of the film, and it raised my spirits somewhat. Some reviewers considered it one of the most Japanese of all the films at Expo. But despite the fact it won an award at Expo, the ministry considered the whole venture a failure and they didn't even announce the award. GP And you've never been asked to make a film for Ontario since? CC Oh, no, and it would be wrong for me to do another. There are great young talents who should be given a chance. But I will say this, Ontario Place was built and put up entirely as a result of the success of Expo 67. They had Cinesphere, but they weren't going to put in an IMAX screen. IMAX was nearly bankrupt. I convinced Ontario Place that an IMAX system should be included on the grounds that it is a very exciting new medium; it's Ontario, and it's going to be sold to the States if they don't adopt it. So they decided to install an IMAX projection system. In 1973 the new director of Ontario Place, Ian McLennan, asked me to do Toronto the Good, a multi-media show using 36 slide projectors in combination with 35-mm film, and I enjoyed working with Francis again. It was done in remarkably short time, and the possibilities were so exciting; the film part was going to be there all the time, but over the seasons we could change all the slides. They were designed for that purpose, so there was always something new. It did very well and there were some tremendously nice comments.